To begin your full or part-time career in diving, attain the PADI DiveMaster rating. After successfully completing PADI Advanced Open Water and Rescue Diver training, you'll work closely with our PADI Instructors to expand your diving skills & knowledge to the professional level. Then, in the most fulfilling part of the course, you'll learn and practice supervising and assisting with student training through two complete Open Water classes. As a PADI DiveMaster, you may supervise and assist with both training and non-training dive activities in a variety of environments. PADI Dive Centers and Resorts employ PADI DiveMasters to help with classes as well as lead guided dive tours off of dive boats or the shore. You may also conduct the PADI Discover Diving experience and Scuba Review program for certified divers. Non-divers may also enjoy their first look into the mysterious underwater world under your supervision during the PADI Discover Snorkeling experience and PADI Skin Diver course. The PADI DiveMaster class is the first step along the professional pathway. Offered here at PACIFIC Wilderness on an internship basis, you may begin any time. Just come in, sign-up, and we'll get you started! How quickly you complete the course depends upon you - we allow you to work at your own pace. Completion of the PADI Rescue Diver Class & 20 Logged Dives to Start - 60 prior to Completion of Class. *These Materials should be in your possession already from previous PADI Classes. If you do not own them, you will be required to purchase them. **These Materials are provided in your DiveMaster Class. 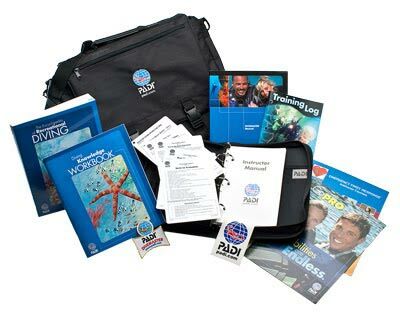 DM Candidates may choose to enroll in the PADI DiveMaster eLearning program. This is completely optional! 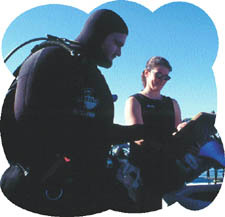 The DM eLearning program is $220 extra (payable to PADI). Pacific Wilderness will offset $100 of the above cost with a $100 reduction in the cost in your Class Tuition. If you choose to enroll in the DM eLearning program you'll save about 8 to 12 hours of classroom time here at the store and spend about the same amount of time working from home at your convenience. Enroll in the DM eLearning program by clicking the Banner above. Cost is $220, but you'll save $100 on the $599 class fee above and hours of in store classroom time. Learn to Identify what is an "Easy" fix & problems you should not attempt to fix. Basic Equipment Repair is covered. Included for FREE if you took your Rescue Class with Us! This allows a Current DiveMaster to teach EFR Classes. A great way to earn extra income in addition to what you'll earn as a DiveMaster. EFR Instructor Materials are extra. **The EFR Instructor Class is now also available in conjunction with our PADI Instructor Course at a reduced “Package” Rate. Simply register for both the IDC & the EFR Instructor Course at the same time and save. So, if you are currently enrolled in the Pacific Wilderness DiveMaster Course and you intend to become an Instructor - just prepay your Instructor Tuition Deposit and you can save $100 on this EFR Instructor Class Now! Simply register for the IDC at the same time as this EFR Instructor Class and we'll knock $100 off this Class Instantly!